Ever since posting US Census 2010 Win, I began to receive a large number of hits on this site. I was first hit by a giant wave (see my previous post The True Impact of StumbleUpon) from StumbleUpon, a site which I use very often. But today, another wave hit, and this time, it was Digg. First spike is from StumbleUpon, second from Digg. I did notice quite a few interesting trends and correlations. And also, I know that, in dealing with real-time stats, the facts might change the next minute. I don’t use Digg (I registered an account but haven’t touched it recently), so you may expect me to be biased toward StumbleUpon. But it turns out that the facts show Digg users to interact with the site more. Explanation: A hit is a visit. “Hits on Homepage” refers to the number of times the homepage of my blog was accessed. It may include readers who did not arrive on it from StumbleUpon; however, that number should be fairly low, considering that the TOTAL visits per day prior to this was about 20-30. Also, if a user goes through more than one page (i.e. to access older posts), each page of posts will count as a hit to the homepage. *Edit: The previous number used the wrong methodology: I was comparing total hits on homepage, including StumbleUpon users, to just Digg hits on “Census.” The new number, 2.83%, is the total, or weighted average for Digg and StumbleUpon that day. Alright, I apologize for not having done extremely sophisticated statistics here, but I do notice that even on this part of one day, the chance that a Digg user clicks my homepage (2.88%) is significantly higher than that for a StumbleUpon user (1.99%). Thus Digg has a lower bounce rate than that of StumbleUpon, at least for this image. This was surprising because I thought StumbleUpon had a significantly lower bounce rate and a significantly higher average time on website and number of pages accessed, from my earlier reading. Sure enough, I found several articles (such as this, this, and this), all pointing to the same understanding that StumbleUpon is better in these aspects for a website. Samples not comparable—for StumbleUpon I measured over a period of five days, whereas for Digg, I measured over a period of less than 18 hours. I’m not exactly sure what difference this makes; maybe because Digg stats have not continued into the evening/night yet, the Digg users are spending more time. Perhaps looking at a site at night makes one more likely to go to the next website. I don’t know. Assumptions outdated—I would normally not use this as an excuse, but it happens that the three articles I mentioned before were all written in 2007 or 2008; maybe by 2010 StumbleUpon’s user base has changed to be more like that of Digg’s. Nature of content not predicted—It’s an image. Perhaps StumbleUpon users spend more time reading articles and less on images. Who knows? Plus, it is in the “Humor” category in StumbleUpon, so perhaps it was not as entertaining as other pages in StumbleUpon’s hilarious “Humor” section. I noticed specifically in my blog stats that the most accessed category tags were “Lol,” which is the section under which the picture was posted. Also, I notice that for Digg, I have approximately the bounce rate that is given by the articles, but I have a significantly higher bounce rate than expected for StumbleUpon. This also points evidence to a likely reason being the nature of content. Whatever the case, go StumbleUpon and Digg! Update (3/27/10): For 3/26/10, complete day. 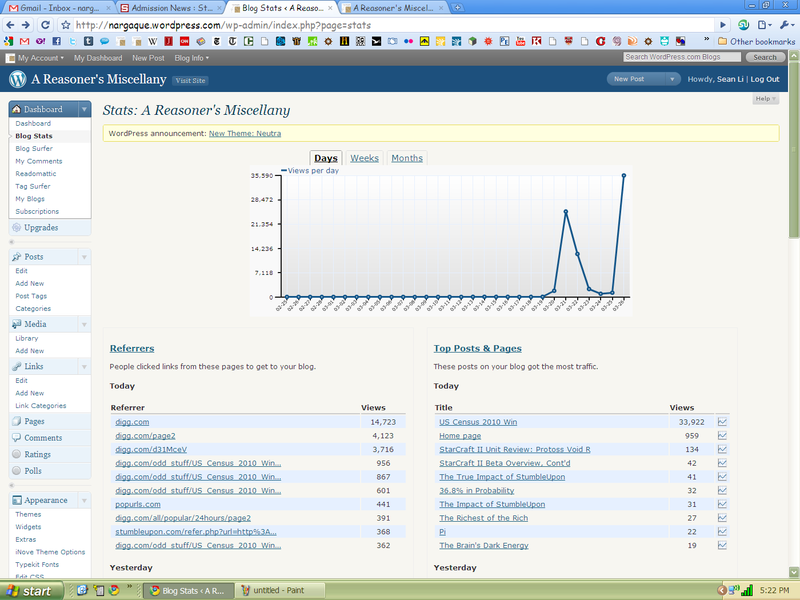 The stats for Digg as shown above went up to 5:22 pm on 3/26/10. This time, it’s the full day. Interestingly, the interaction rate decreased over time. At 5:22 pm, as seen above, it was at 2.83%. From 5:22 pm to 12:00 am, the number of hits was the day total minus the number up to 5:22, or 81,474 − 33,922 = 47522. Likewise, the number of homepage hits in this time interval was 1906 − 959 = 947. This gives a division ratio of 1.99%, which is coincidentally the exact same as for StumbleUpon the past few days. When this 2.83% and 1.99% are weighted, the total ratio is 2.33%. This seems to imply that at night, viewers are less likely to interact with the site than they are during the daytime. That sounds like a good idea. Updating with the full stats for 3/26/10.